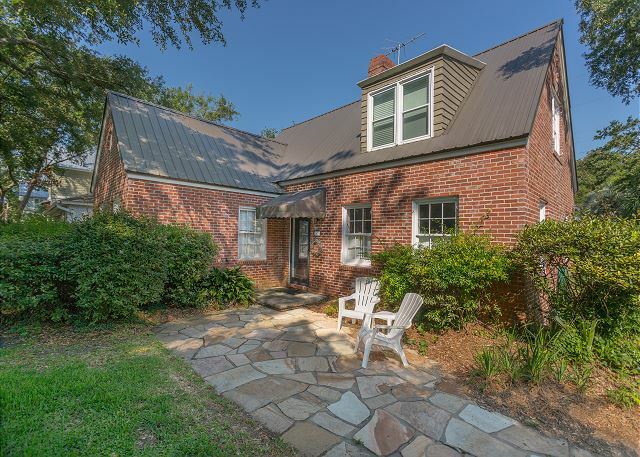 East Beach Folly is a 5 bedroom, 3 bathroom home located on the corner of Bruce Drive and Third Street in the much desired area of East Beach. The home has two separate living areas, a screened porch and a 15 ft x 18 ft pool. The bedrooms downstairs consist of a King bed, two bunk beds and queen bedroom. You have to walk through the bunk bedroom to get to the queen bedroom. There are two full bathrooms downstairs. Upstairs has two additional bedrooms and a full bathroom. One of the upstairs bedrooms has 2 double beds and the other has a queen bed. Dog friendly rental! 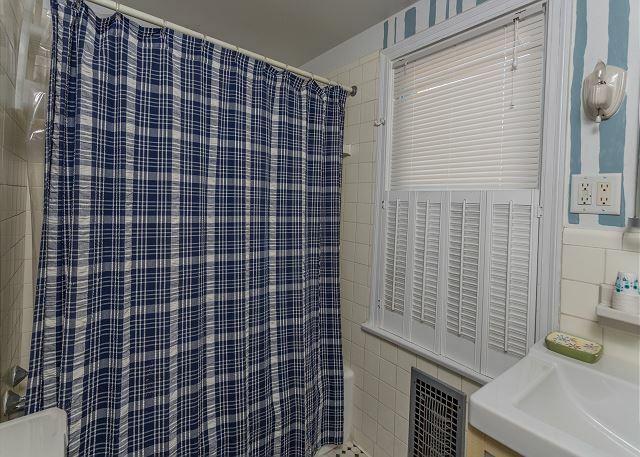 The highlight of this rental was, by far, the location! It was a very short walk to get to the public beach access at east beach. There were plenty of bedrooms for a larger group to spread out. The house itself is a bit dated, but clean. It was too cold to enjoy the private pool, but it was still a nice place to hang out after a day on the beach. Always liked this house - stayed at East Beach Folly before. Great house for large family. Good layout for our family, but not well maintained. Was dirty,lacked supplies, general safety features, and old appliances with problems. Very small kitchen. Would recommend only if these issues addressed. A wonderful family gathering from 3 states to spend the week at St. Simons Island and enjoy beach, family, food, shopping, golfing, etc., and to give thanks for our many blessings. The house was well equipped for cooking large Thanksgiving dinner, as well as lots of room for small or large conversations, and/or, tv watching. Grandchildren even enjoyed short times in the pool (temps in low 70s). Rental was comfortable. Needs some landscaping and new awning at front door. Had one rat! Exterminators took care of the problem. The house was really nice. We loved the fact that there were 2 family rooms on the main floor. The bunk beds and extra bedroom on the main floor were perfect for teenagers (bunk bed) and older parents (extra bedroom). My only complaint was that the steps leading upstairs were extra steep that I bumped down them on my behind because they were scary. The pool was nice and clean with chairs and an umbrella. A very nice and relaxing stay at a beautiful house. Perfect house for girls! Very clean and tidy and close to beach. East Beach Folly is FUN! Great location for our family gathering for beach and pool fun. Perfect for a family with small children. There is a grill available although we did not use it. We stayed at East Beach Folly for a week in June and loved it! The house had plenty of room for 11 of us. The pool was great for a refreshing dip after the beach. This house is perfect for kids and pets. There was a dead roach in the closet of the queen room on the main floor (off the family room and next to the pool). We didn't see any other unsavory (or live) insects in the house, though. You can tell the house is older, but other than that one dead roach, the house was pretty clean and only a short walk to the beach. It was also a short drive to the pier. We especially liked the fact that the property was completely fenced in and pet friendly. Overall, the property met our needs. 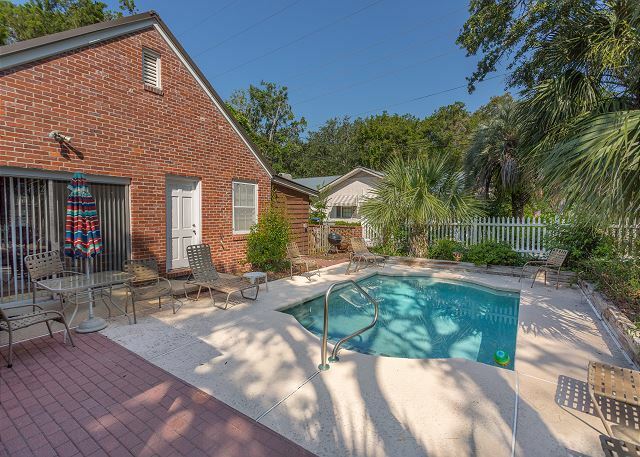 This property was in an ideal location on SSI, a five minute walk from East Beach. We enjoyed relaxing at the pool, grilling on the barbecue, and enjoying a meal in the screened porch. This property would be perfect for 3-4 couples, family and children, or a group of friends. Realescapes Properties provided excellent service.